The Leprosy Mission has made huge progress against this disease. But there are many regions in the poorest parts of the world where it still strikes. These shoes are a lifeline. They not only help a leprosy-affected person regain their mobility — they help them reclaim their income. Their freedom. Their dignity. 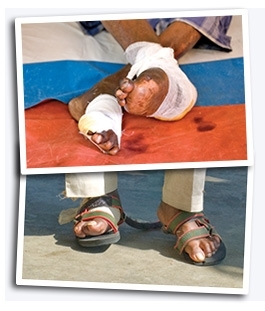 With your gift, we can provide a pair of protective shoes and life-changing care for someone whose feet have been horribly damaged. The most wonderful part is that it costs just $10 for one pair. Just $10 to give a suffering person the chance to walk, work and live a normal life again. You or I might think very little about putting on a pair of shoes. But for someone who must walk miles upon miles on swollen, nerve-damaged bare feet that are completely numb, protective shoes can be life-changing. Please fill in the donation form to send your gift of these special, important shoes. Each pair is just $10, so please select a donation amount in multiples of 10 for the number of people you would like to help. Thank you for the gift of healing and hope, your generosity and compassion will bring to someone who has leprosy. You can donate online now and make a real and lasting difference. It is simple, fast and safe.